Cattle swirl in their pens waiting to be sorted for shipping at the Seminole Tribe of Florida’s Big Cypress Reservation. Photography by Carlton Ward Jr.
Florida has the longest history of cattle ranching in America, beginning when Ponce de León brought cattle and horses to the New World from Spain in 1521. When my ancestors moved to Florida with the first waves of American settlers in the mid-1800s, cattle had been living wild in the Florida woods for three centuries. Members of my extended family and others who continue ranching today embody a Florida tradition that dates back nearly 500 years. I’ve been photographing Florida cattle ranches for the past twelve years and have found heroes in the men and women who are the keepers of the Florida frontier. One group of inspiring Florida cattlemen belong to the Seminole Tribe of Florida. They are descended from a great Creek chief named Cowkeeper who began amassing large herds of cattle, taken from the Spanish, in the mid-1700s. Today, the Seminoles are one of America’s leading producers of beef, with main ranches located at Brighton and Big Cypress in South Florida. 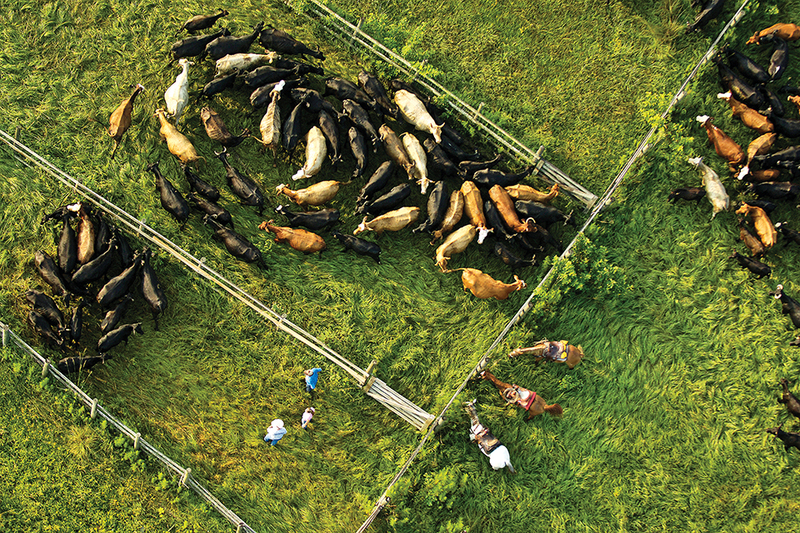 This photograph was captured from a helicopter looking straight down at a set of Big Cypress cowpens on a July morning when Seminole cattlemen and cattlewomen were parting their herds.